Here's a kumara dish for Matariki. Kumara have been grown in Aotearoa for a very long time. 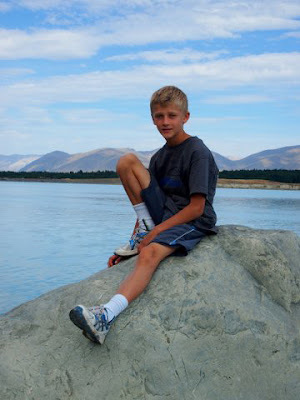 It is thought that they were first brought here by early Maori settlers from the Pacific over a thousand years ago. My Kumara Bravas recipe was inspired by Patatas Bravas , a classic Spanish tapa dish which is served in bars all over Spain. Bravas means fierce . In this recipe the bite isn't too fierce.It comes from the hot chilli sauce. Matariki, the Maori harvest festival invites us to celebrate and share. 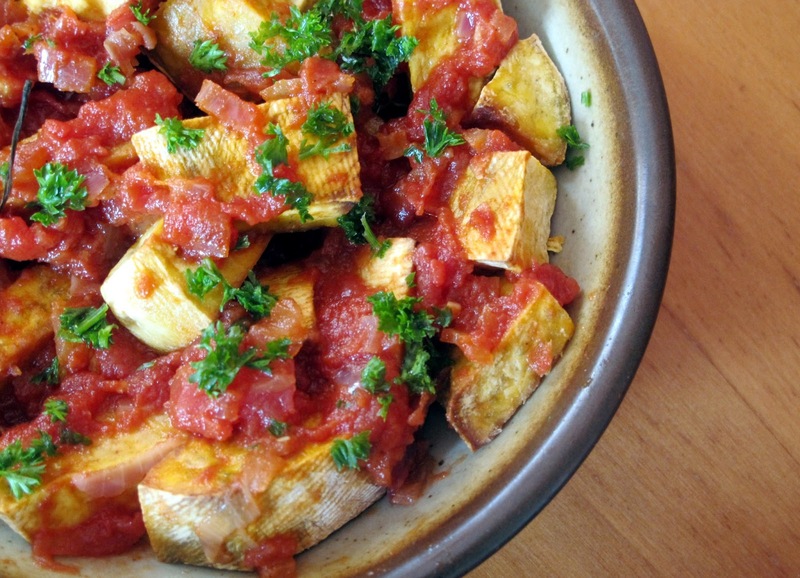 So put the kumara bravas on a big platter . Pass it round with some toothpicks so everyone can dip in and enjoy. If you haven't used smoked paprika before start with a little, it's an acquired taste but I think it really makes this dish special. Chop the kumara into chunky pieces. Toss with a tablespoon of coconut oil and bake in a 200 degree C oven for about 20 minutes until they are crisp and golden brown. They may need a little longer. While they are baking prepare the sauce. Heat 2 tablespoons of vegetable/olive oil in a frying pan and fry the onion for about 5 minutes until it has softened. Add the crushed garlic and fry for a further minute. Add the remainder of the ingredients. Simmer for about 10 minutes stirring the tomatoes and mashing them with the back of a fork from time to time. The sauce should be pulpy and will have reduced. Arrange the kumara wedges on a platter. Drizzle some of the hot sauce over the top. 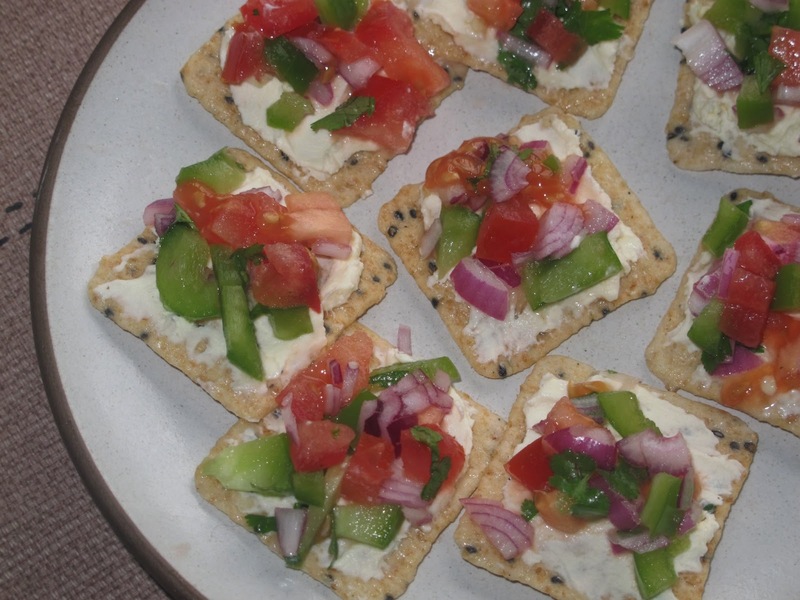 Crackers with Chilli Cream Cheese and a Mexican Salsa. 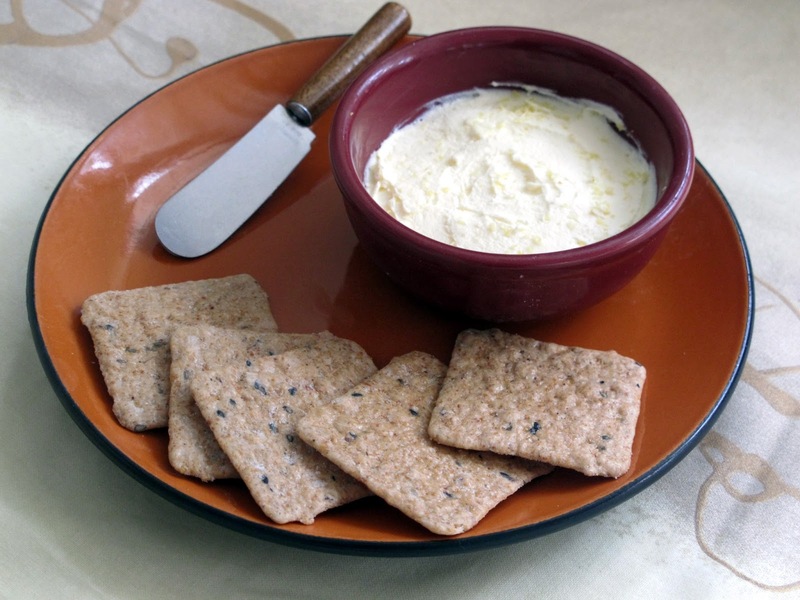 Spread brown rice crackers with a Hot Samoan Boys cream cheese dip, top with a Mexican Salsa, and you have a delicious healthy snack. Start by making the dip. Beat together 300 grams of cream cheese, the juice of a lime and a few drops of Hot Samoan Boys Chilli Sauce. Add finely grated lime rind to taste. It's the zest of the lime, the outer green part of the peel that you want here. Do not use the white underneath, it's bitter. The idea for adding some grated lime rind to this dip came from a Pacific Flavours workshop at Cook the Books, It makes your mouth tingle and adds some zing. Next make a Mexican Salsa (A mixture of chopped tomato, green pepper, red onion , fresh coriander,a squeeze of lemon juice and some salt to taste.) Leave it to rest for a while so the flavours can mingle. 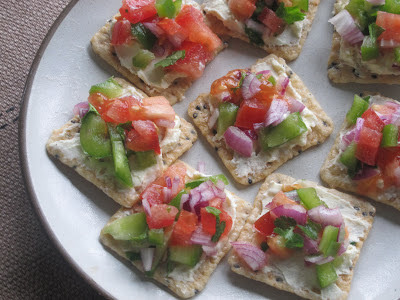 Spread brown rice crackers generously with the cream cheese dip and top with the salsa. Best served straightaway. After a few hours they can go a little soggy. You can also make this with mascarpone instead of cream cheese, more calories but deliciously rich and creamy. 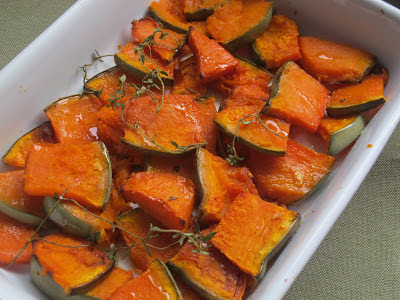 These colourful and spicy pumpkin slices make a healthy and tasty side dish . You don't have to peel the pumpkin which makes life easy! The recipe can easily be doubled, or trebled depending on how many mouths there are to feed. Toss everything together and arrange in a single layer in a baking dish. Scatter some fresh thyme leaves over the top. Bake at 200 degrees C for about 20 minutes until the pumpkin is cooked through and is slightly browned. Go on, put a little fire into your gingernuts! 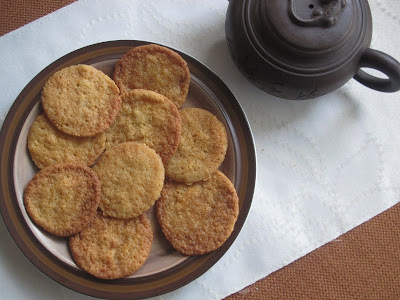 These little cuties are crunchy at the edges and slightly chewy in the middle. For adults only, or staunch kids. Stir in the sugar, golden syrup and beaten egg. Bake in a moderate oven for about 12 minutes till they are golden brown. Watch carefully towards the end of the cooking time to make sure they don't burn at the edges. Once cooked these ancient grains were combined with olives, sun dried tomatoes and garden herbs and tossed in a dressing. Cook Quinoa according to packet instructions. Transfer to a bowl. Allow to cool. Add fresh herbs, sundried tomatoes and black olives. Whisk together dressing ingredients. 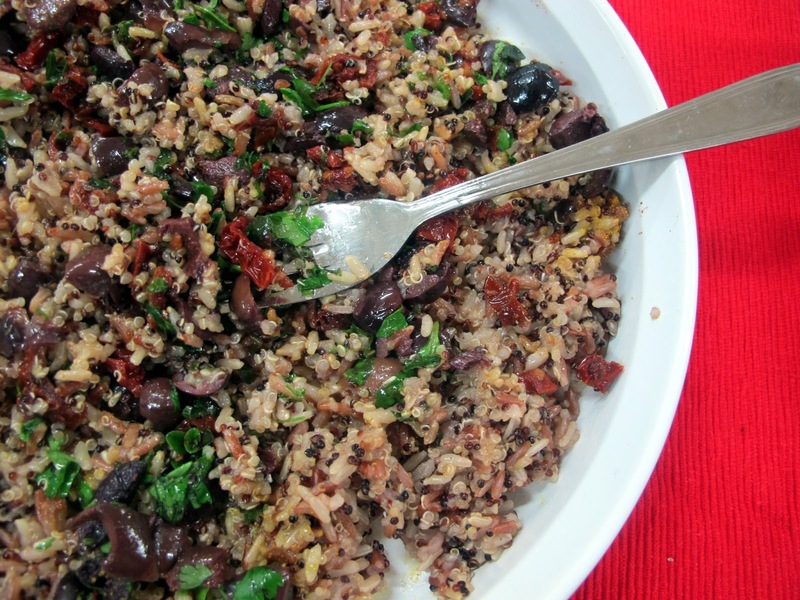 Toss with quinoa. 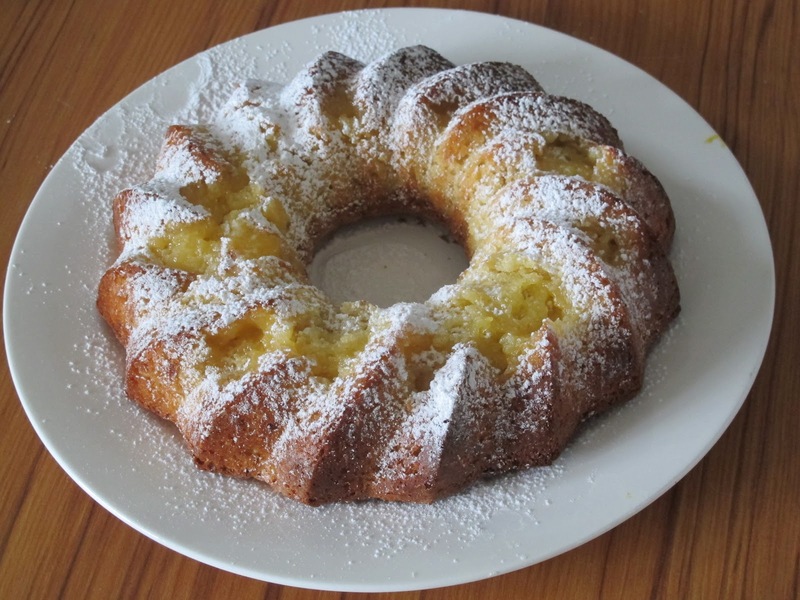 Joyce has kindly posted the recipes we tried on the IE produce website. To see them go to http://www.ieproduce.com. Some biscuits. like people, just need their own space. That's just how these gingernuts are. Leave plenty of room between them as they bake or they'll spread out and stick to their neighbours. Still, even the conjoint ones tasted really nice once they'd been broken apart and just as I remembered them from Nick's Playcentre days. Crisp at the edges and a little chewy in the middle, they came from his friend Robert's Mum. Remove from heat and add sugar, golden syrup and beaten egg. Bake in moderate oven for about 12 minutes till they are golden brown. 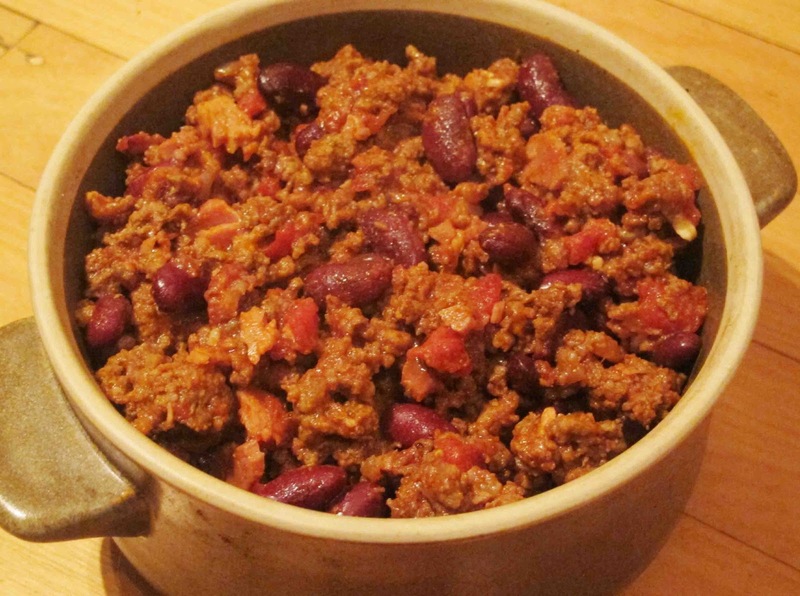 A big pot of Chilli Con Carne will keep the wolf from the door on a blustery chilly winter's night. This spicy comfort food is inexpensive and filling. Leftovers taste even better the next day. Be careful not to make it too fiery if there are children about, they tend to like mild. So adjust the amount of hot chilly sauce to suit their taste. Adults can turn up the heat as much as they like. 2 tablespoons of tomato puree. Heat the oil in a frying pan and cook the onions and bacon over a medium heat for about 5 minutes, stirring frequently until the onions are softened. Add the garlic and fry for another minute. Set this mixture aside. In the same frying pan brown the minced beef, stirring it with a spoon to break it up, for about 5 minutes. All the pink bits should be gone. Transfer the mince to a large saucepan. Add the onions, bacon and garlic. Stir in the tomatoes in their juice, the beef stock, the oregano, tomato puree, a dash of the hot chilli sauce, and salt and pepper to taste. Simmer gently on a low heat with the lid on for about 45 minutes, stirring from time to time. It should be thick but still moist. Add the red kidney beans and continue to cook, again with the lid on, over a low heat for 10 more minutes. Adjust the seasoning at this stage. You may want to add more chilli sauce as well as more salt and pepper. To serve put tortilla chips in large bowls and spoon over the Chilli Con Carne. Top with lots of grated cheddar cheese and spoonfuls of sour cream. Or simply serve with some boiled rice. We went to a drinks and nibbles party at the Auckland Zoo last night so I created these little savoury pastry roll ups. So good! (Multiply as many times as you like depending on numbers). Each sheet will make about 20 . Crush the walnuts inside a plastic bag by bashing them with a rolling pin. Mix cheese and walnuts together in a bowl. Spread them over the pastry sheet. Press down on them with your hand to make them stick. Cut the roll into 1/2 cm slices with a very sharp knife. Nicest served warm but still good when they have cooled down. This is a the kind of hale and hearty savoury slice which will warm you up and stick to your ribs in this wintery weather. And it's totally vegetarian. Put the flour, baking powder and salt into the bowl of a food processor. Whizz until the mixture looks like breadcrumbs. Pour this over the dry mixture . Add the grated courgettes and chopped parsley to the bowl. Stir until everything is just combined. Serve with sweet chilli sauce and a small mesclun salad. Heat up your day with a cup of hot chilli chocolate. It's so good! 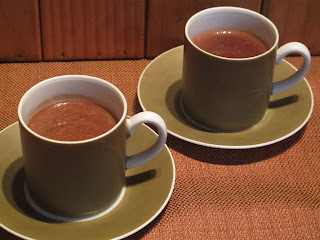 To make it ( for each person) brew up a cup of a good drinking chocolate ( I use Kokako which has a pure and intense flavour and is both organic and Fair Trade. Then drop in a square or two of dark chocolate and a splash of chilli sauce ( I used Hot Samoan Boys Chilli Sauce) and stir until the chocolate has melted. Reheat for a few seconds if necessary. 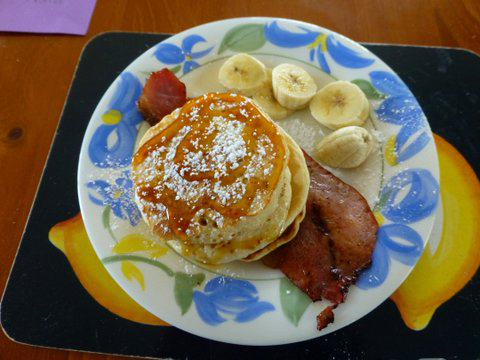 Here's a family recipe from Jacob who makes these delicious hot cakes every Sunday morning . 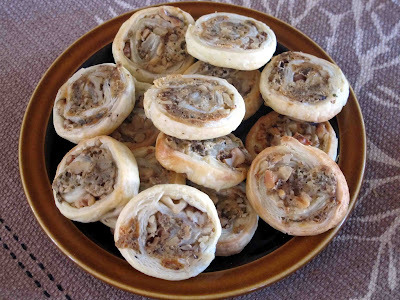 They are a perfect with bananas, bacon and maple syrup. I love the way he so stylishly arranges them on a plate. Or you can simply serve them with lemon and sugar. Full of rolled oats, coconut and lightly sweetened with golden syrup my latest batch of crunchy muesli was inspired by Anzac biscuits. 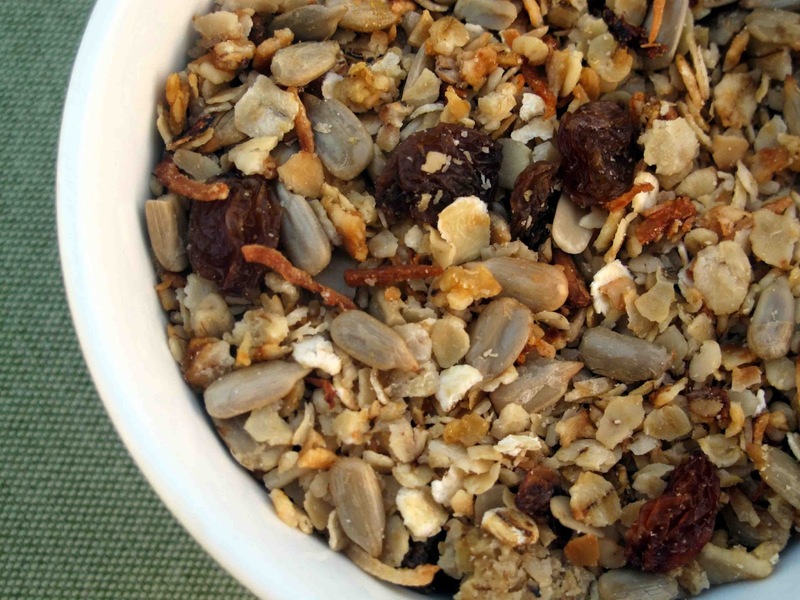 This muesli will kick start your day and keep you fighting fit. When I served this to a close relation of mine (who shall remain anonymous) for breakfast he said it made him feel as if he had just come out of the trenches in Gallipoli. Nevertheless he happily polished off a bowl full of it. Put all ingredients except the raisins into a large bowl and mix well. Spread out in a large baking dish. Bake at 150 degrees C for about 45-60 minutes until just starting to turn golden brown. Keep an eye on it while it is baking and stir from time to time. When it is done, add the raisins. Later in the week, after I hopped on the scales I made a skinny version. It still tasted good, well maybe not quite as good but for the sake of good health it's a responsible alternative. Mix well and spread out in a large baking dish. Bake at 180 degrees C for 30 minutes. Stir from time to time and check towards the end to make sure it is not browning too much. Serve with trim milk/skinny yoghurt. Go on, do it! Warm the cockles of your hearts with these hot and spicy Samoan Boys Chilli olives. Perfect to nibble on with a glass of wine. Rinse the olives and drain. Mix with the other ingredients. 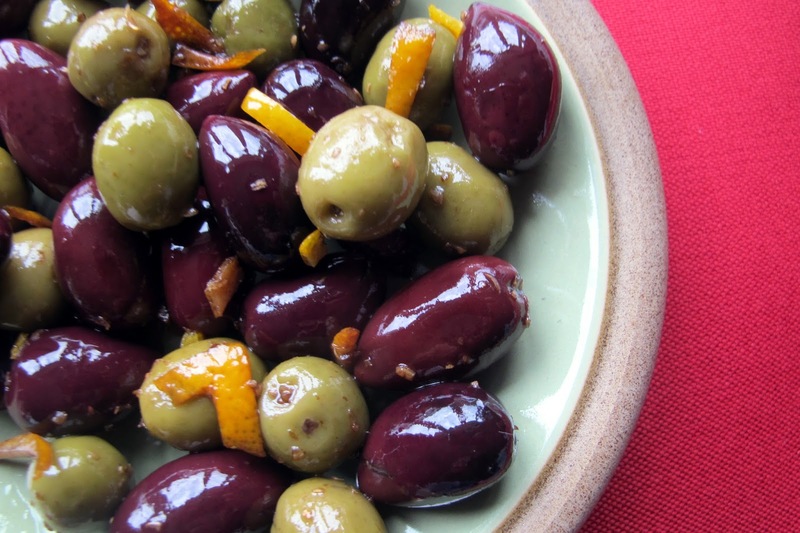 Cook in a fry pan over a low heat for about 5 minutes, until the olives are thoroughly warmed. 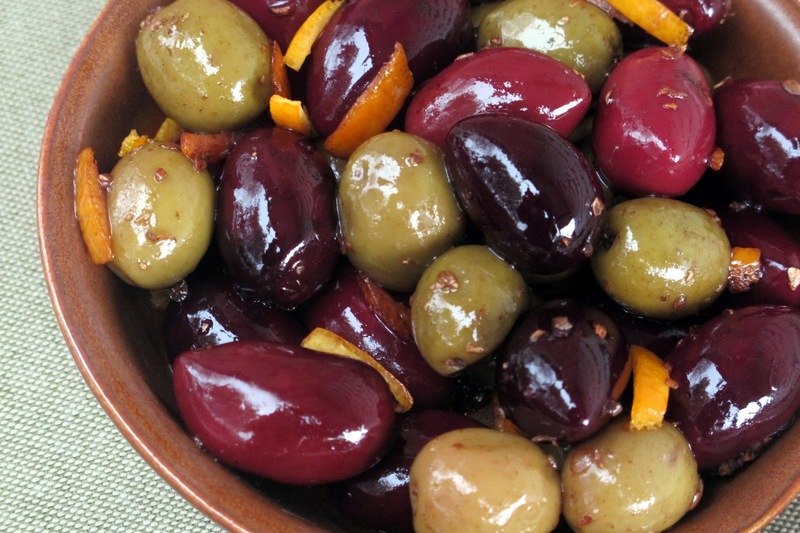 Leave to stand in the fry pan for a few minutes so the flavours infuse the olives. They can be prepared to this stage and reheated . This hummous is light and citrussy. A splash of Hot Samoan Boys Chilli Sauce is the secret ingredient. It gives it a fiery little kick. 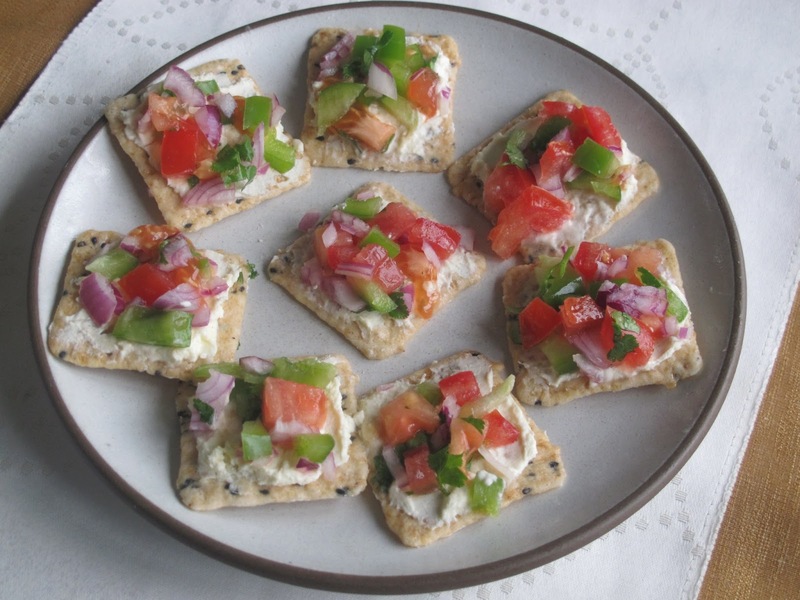 Served with triangles of toasted pita bread or crackers, it makes a healthy snack. 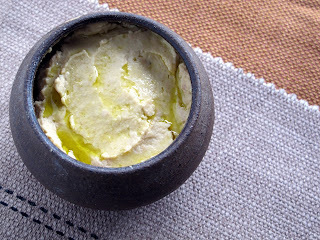 For a skinnier dip don't dribble it with olive oil. It will still taste good. And it will happily keep in the fridge for a few days. In a food processor put the chickpeas, 2 tablespoons of the reserved liquid, and all the other ingredients except the olive oil. If the mixture is too thick thin it down by adding a little more of the reserved liquid. Then adjust the seasoning and if you like more fire, increase the amount of Hot Samoan Boys Chilli sauce. Put in a bowl and drizzle some olive oil over the top before serving with toasted triangles of pita bread. I had the pleasure of reviewing the new cookbook from Ripe Deli recently for The Breeze Auckland radio station website and this was one of many delicious recipes I cooked from it. 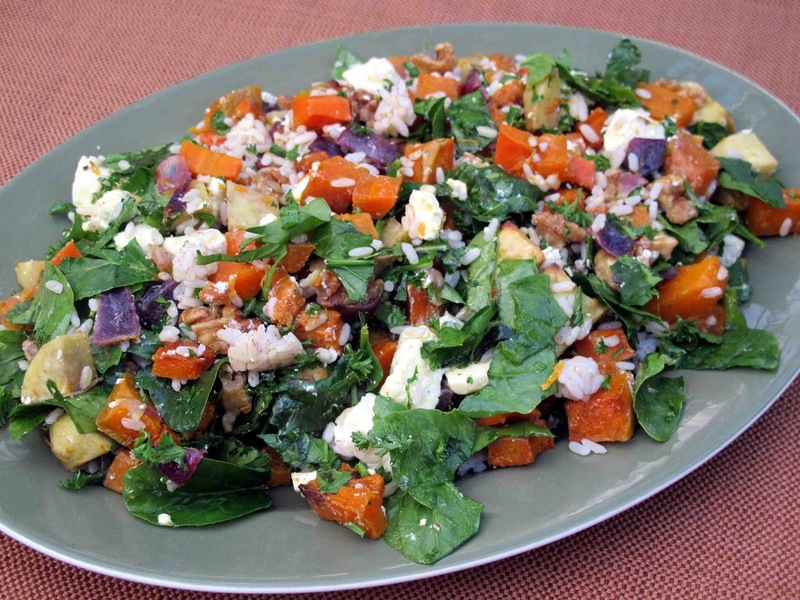 From Ripe Recipes - A Fresh Batch, a combination of roasted root vegetables, walnuts, spinach and feta cheese, flavoured with orange and fennel. Its vibrant autumn colours looked stunning on a large platter. 1. Preheat the oven to 180°C. 2. Grease and line a large high-sided baking tray with baking paper. 3. Cook the brown rice (see pg 250). 4. In the prepared tray, place the carrots, kumara, pumpkin and red onion. 5. 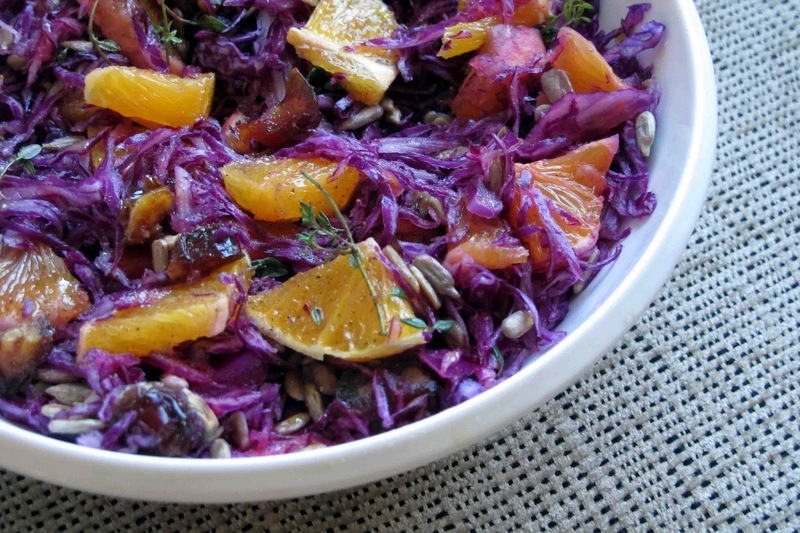 In a small bowl, place the orange zest and juice, fennel seeds, brown sugar, olive oil and salt. Mix well. Pour over the vegetables and toss to coat. 6. Bake for 30 minutes. Add the walnuts and cook for a further 5-10 minutes until the walnuts are toasted and vegetables are cooked through. 7. Remove from the oven and allow to cool. 1. place all the ingredients in a jar with a tight-fitting lid and shake well. 2. 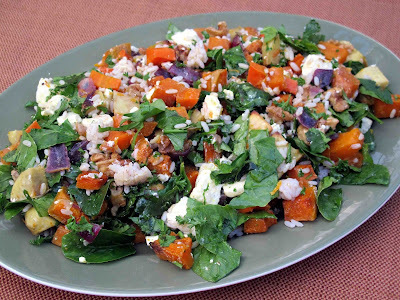 In a large mixing bowl, place the roasted vegetables and walnuts; add the rice, feta, parsley and spinach. 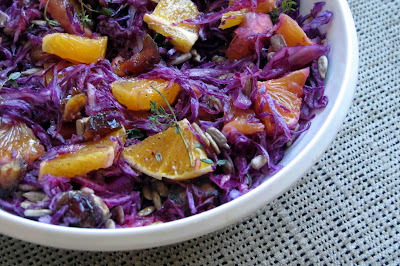 Drizzle the dressing over the salad, gently toss to mix through. 3. Season to taste with salt and pepper. Customers had been begging for a sequel to the first Ripe recipe book from the popular Grey Lynn deli, known for its salads, take-away dinners and scrumptious cakes. Now they’ll be able to recreate more of their favourites at home. It was a labour of love and a team effort. “Making cookbooks really brings out the best in my staff. It keeps them motivated, innovative and creative in our quest to bring healthy, tasty food to the table.” said Angela. The recipes are arranged to suit different occasions such as finger foods, lunches and soups, deli dinners, puddings, Mexican food and Friday Pie Day. At Ripe they see food as the best medicine. Little “nutrition bites,” have been added to each page by local nutritionist Nellie Pigot. 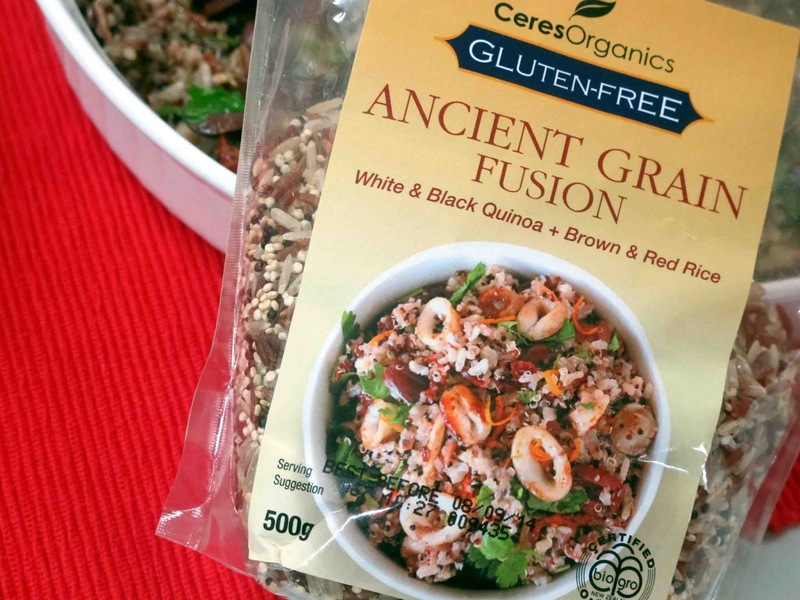 Autumn Harvest Brown Rice: A combination of roasted root vegetables, walnuts, spinach and feta cheese, flavoured with orange and fennel. Its vibrant autumn colours looked stunning on a large platter. Big Fat Eggplant and Chickpea salad dressed with pomegranate molasses, hazelnut and lemon juice. Bob's Lentil, Silverbeet and Mushroom pie: a lightly spiced vegetarian shepherd's pie with lentils, mushrooms, and silverbeet topped with mashed potato and kumara. This was real comfort food for a meatless Monday dinner. Macaroni Cheese: A creative spin on an old favourite, laced with baby spinach and topped with a crispy crumbs. We’re looking forward to trying the adult version as well made with artichokes and blue cheese. Cashew and Honey Crusted Pork Fillet: fillets of pork marinated, and then crumbed with a mixture of breadcrumbs, fresh coriander and cashew nuts. This was elegant and took some time but not difficult to put together. Perfect for when friends are coming to dinner. The Fejoa and Ginger Layer Cake: Yes, it’s laden with sugar and calories but after so much healthy food a little decadence is surely allowed! This scrumptious cake was moist and packed full of feijoas, crushed pineapple and walnuts interlaced with a rich gingery cream cheese icing. 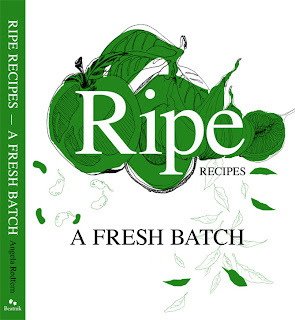 “Ripe Recipes- a fresh batch,” has already become one of my most used recipe books. Their recipes are great for the taste buds. Bring some water to the boil and add the tortellini. Follow the instructions on the packet for the correct cooking time to the al dente stage. Mine took 7 minutes. 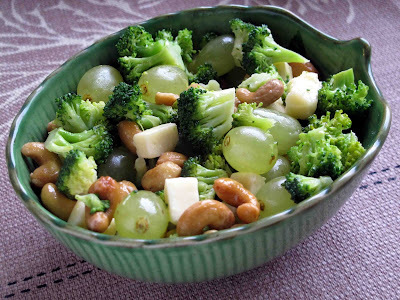 For the last minute or two of cooking time add the broccoli florets. In the meantime heat 3 tablespoons of olive oil in a frypan. Gently fry the onion and garlic for about 3 minutes until the onion is starting to soften. Add the red pepper and fry for a couple more minutes. Season to taste with salt and freshly ground pepper. Quark is still an unfamiliar item in many kiwi kitchens, although popular in Europe. The Hohepa biodynamic quark is really nice, especially their award winning herb quark. But if you can't find this plain quark should be fine, just add a few finely chopped fresh garden herbs, or some chopped basil. 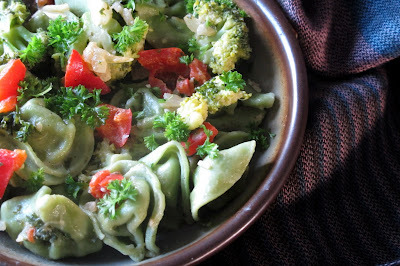 Quark could also be replaced in this pasta dish by creme fraiche. Food Photography Notes: I took off my long winter scarf for just long enough to wrap round this dish and take a quick pic. 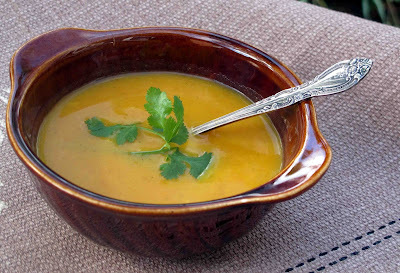 Celebrate Matariki, the Maori harvest festival, with this mellow roast vegetable soup, made with kumara, pumpkin, and carrots. Invite the whanau over and enjoy steaming hot bowls of it with some garlic bread or some rawene. Roasting the vegetables intensifies their flavour , The cream is optional but enriches this soup and for a special occasion I wouldn't leave it out. The recipe can easily be doubled or tripled depending on numbers. It is similar to the root vegetable soup I posted last weekend but I think that roasting the vegetables has made a significant difference. And for a roasted vegetable soup I have used an onion rather than a leek. 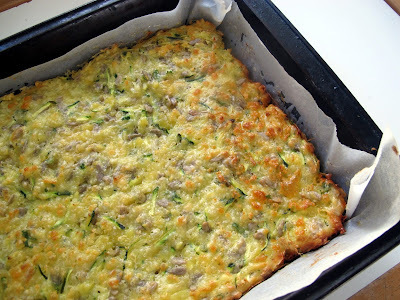 Toss the vegetables and garlic together, then spread out in a single layer in a baking dish. Bake for about 20 minutes until they are done. Squeeze the garlic out of its skin. Put the vegetables and garlic into a large saucepan and add the stock. Bring to the boil and simmer for 5 minutes. Swirl in the cream, do not let it boil again. 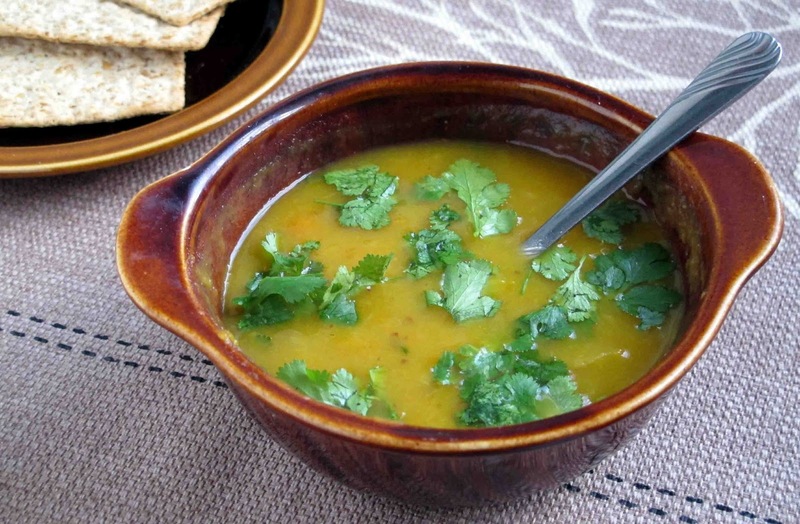 Use a stick mixture to make a smooth soup. Season to taste with pepper and salt. Charles Royal, well known Maori Chef, sees Matariki as “the time when the sap runs, and a good time to plant and transplant any plants that need to be attended to before the growing season”. A Feast is always part of it. But although Charles is passionate about food he feels that Matariki is more about people getting together than about what you put on the table. His plan for Matariki this coming weekend is to have a pool party with some of his friends at a local ngawa (hot mineral pool). Charles will be taking along a selection of canapés with kawakawa and lime jellies as the cleanser before the pot luck dinner starts. Then they’ll share what everyone brings. For inspiration on what to serve for a celebratory Matariki feast I delved into his new book. Cooking With Charles Royal is more than a collection of recipes. He takes readers on a fascinating culinary journey in which he teaches them to identify and gather New Zealand native plants and herbs such as kawakawa, pikopiko, wild bush mushrooms and ferns in the bush. And once they are harvested how to use these to create dishes with a contemporary twist. Some of his whanau’s best loved homely recipes such as his Nanny Hine’s Rewena bread, his Aunty Tangi’s Paraoa Parai (fried bread) and his Nanny Cinny’s Boiled Pudding are also divulged. Many of the recipes in this book make use of Kinaki dried herbs and rubs which were developed by Charles and his wife Tania as a result of their interest in the Slow Foods movement and experiments done with native plants. I chose the Halloumi and Wild Salad Mix for the starter. For this Halloumi is tossed in flour and Kinaki 3 Pepper Spice, teamed with a salad made from watercress sprouts, baby puha and rocket leaves and dressed with horopito-infused balsamic vinaigrette. The Horopito rack of New Zealand lamb would make a flavorsome but elegant main. The rack is sprinkled with horopito pepper before roasting. Steamed kumara and Maori potato wedges are put into the roasting pan while the lamb is resting. Some wilted New Zealand spinach would go well alongside. For dessert I’d serve the sticky kawakawa meringues alongside a platter of seasonal fruits such as persimmons, kiwifruit, tamarillos and mandarins) and lashings of whipped cream. We’re city dwellers so won’t be able to harvest piko piko ferns and supplejack vines from the bush. But these ingredients are optional. I’ll use what we do have and the food will still taste good. In any case, as Charles would agree at Matariki time above all it’s the company which counts. I was inspired by a recipe from River Cottage Veg Every Day to make this salad .Well, to be honest I copied it almost exactly, except for the parsnip. It's a healthy vegetable, but its colour is so insipid and it's slightly bitter. I exchanged it for toasted sunflower seeds before I photographed it. Seduced by the vibrant colours I couldn't wait to have some of this salad for lunch. Later we had the leftovers for dinner I had to stretch them out to feed two of us so added some blanched carrot batons. I'll do that again next time. Pour over the reserved orange juice, drizzle over the olive oil, sprinkle over the thyme, finish with salt and pepper. This basic soup is cheap and sustaining winter comfort food. I made it at the end of the week to use up a piece of pumpkin, two small kumara and couple of carrots that didn't quite make it to the dinner table. Personally I think leek gives a more mellow flavour than onion here, but an onion will do at a pinch. Add all the root vegetables and fry gently for 4-5 minutes until they are heated through. Sprinkle a generous tablespoon of flour over the top and toss this through the vegetable mixture with a large spoon . Then fry for another minute. Simmer for 20-30 minutes until all the vegetables are tender. Leave the soup to cool for a few minutes before using a stick mixer to make it smooth. Ladle into bowls and garnish with chopped parsley or coriander. 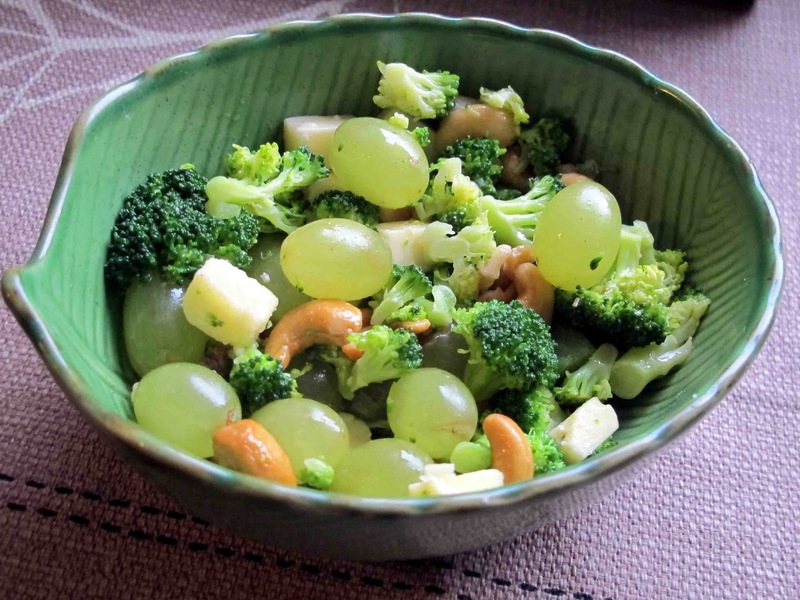 For this winter salad I tossed some broccoli florets, cubes of Puhoi peppered Havarti, roasted and salted cashew nuts and seedless green grapes together. I dressed it with white balsamic vinegar and virgin olive oil and tasted before seasoning. As the cashews were salted, and the Puhoi Havarti was peppered it didn't need much. It was crunchy, salty and sweet and just right for lunch. Although the broccoli can be left raw I prefer to blanch it, or microwave it in a lidded container with a couple of tablespoons of water for 3 minutes to soften both the texture and the flavour. Left raw, it can be a little too assertive for our taste. This is one of those easy cakes you can just mix in a bowl with a fork. When Rachel brought me a jar of Aunty Von's lemon curd I played with it and added some to this easy yoghurt and lemon cake . I dropped blobs of it onto the cake batter and hoped that this would rise up around them, and it did. Served warm with thick Greek yoghurt it makes a tangy comforting winter dessert, or you could leave it to cool and have some with a coffee later. Add the flour mixture into the yoghurt mixture, and whisk together with a fork until just mixed. "Baking can be a bit like a painting, if you make a mistake you can often cover it up with icing or rename it," I said to Becky when her cinnamon sugar swirls unfurled in the oven. Just call them snails. She had booked in a baking session with me to make something nice to take for a shared lunch at school. 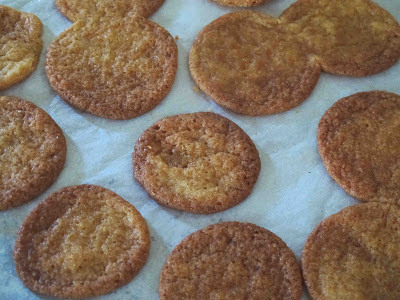 These crisp and sweet little morsels are so esay that a 10 year old can make them herself. 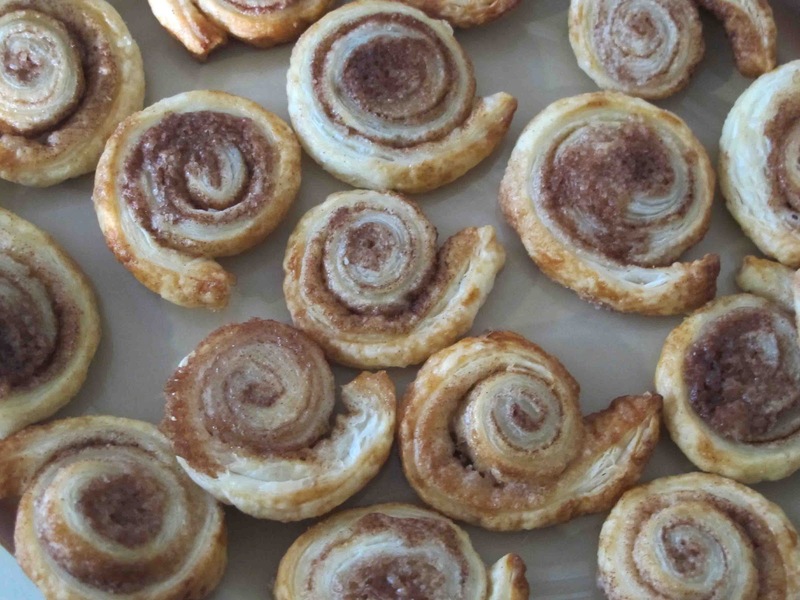 We used all the 5 sheets in an "Edmond's Sure to Rise Flaky," pastry packet. This made several dozen. More than enough for kids to snack on for afternoon tea as well as having plenty to take to school the next day. You can make less of course. For the filling start with 3 tablespoons of melted butter, and a mixture of 2/3 cup of castor sugar and 3 tablespoons of cinnamon. If these run out just mix up more but keep the same sugar-cinnamon proportions. The glaze makes them shiny. Peel off each sheet but leave it on its plastic backing. Sprinkle a layer of cinnamon sugar over , leaving a 2 cm border at one end. Press the sugar and cinnamon mixture on with your hand. Brush the border with water. Line oven trays with baking paper. Use a pastry brush to brush with the glaze. Bake at 180 degrees C 12-14 minutes until they are golden brown. Lift with a spatula and cool on a rack. Serve while hot, or store in a tin for a day or two when cool.